Opteon recently partnered with the Australian Property Institute (API) and sponsored their annual Public Sector Conference held in Sydney on 18 November 2016. Master of Ceremonies – our very own Phil Western, National Government Services and Assets Manager – interviewed a number of guest speakers on the day. Today we focus on guest speaker John Brady from the CBD Coordination Office for Transport NSW. John thanks for speaking to me at the API Pubic Sector Conference about the Sydney Light Rail project. Prior to its commencement, there was a lot of negative media activity surrounding the project. There were concerns that Sydney’s CBD would become a carpark, and the greatly feared ‘doom and gloom’ impact on retailers during the lengthy construction period. From my observations, the CBD still appears to have reasonable traffic flow and very few retailers have been active in the media with negative comments. What are your insights on why the construction phase of the Sydney Light Rail project has been a success from a public perspective so far? This type of project had never been undertaken before so it was not surprising that people were concerned. A lot of work went into helping people understand the context for change and the challenges that would lie ahead. At the same time, we have broken new ground in trying to work with business groups and businesses to keep Sydney moving. This has included business activation initiatives, travel demand management, the promotion of alternate routes for motorists and close consultation with freight and delivery. We have maintained Sydney’s reputation for managing special events and we’ve helped to ensure that the record levels of private development can also be accommodated. Not for a second would we profess it is easy for retailers and people using the CBD during the construction period, but the city has found a rhythm. I think people can see we are out there looking to mitigate the impacts as much as possible and that we are working towards an integrated transport objective that will change the face of the city and promote growth in the future. Given the compulsory acquisition process for the construction of the Light Rail project, John what are some of the key issues your department has had to address during this period and how have they been overcome? There was very little acquisition as such. Other than one block of units in Surry Hills the project has worked within either transport corridors or land areas that have been the subject of commercial agreement with bodies such as the Centennial and Moore Park Trust and the Australian Turf Club. It has been a collaborative process and that has been critical in reaching this point. Finally John, what will be the benefit to Sydney when the construction of the Light Rail is completed? The Light Rail will deliver a range of economic benefits from the jobs created during the construction, to future reductions in the congestion costs and public transport operating costs. It will lead to increased journey reliability, improved public transport use and productivity, to a better and healthier environment for improved pedestrian amenity. With a one kilometre pedestrian zone between Hunter and Bathurst Streets, and a revitalized Circular Quay, the Light Rail will change the face of the CBD. Equally, it will connect communities and business districts along the alignment. The private development that is already taking place in the CBD is a clear sign that businesses are investing in the benefits that are around the corner. Sydney is growing and transport is a key to unlocking the full potential of that growth. Light Rail is one part of an unprecedented level of investment in our transport future, one that includes major CBD station upgrades, new ferry terminals, Metro, a re-designed bus network and pedestrian and cycle facilities. John Brady is from the CBD Coordination Office for Transport NSW. 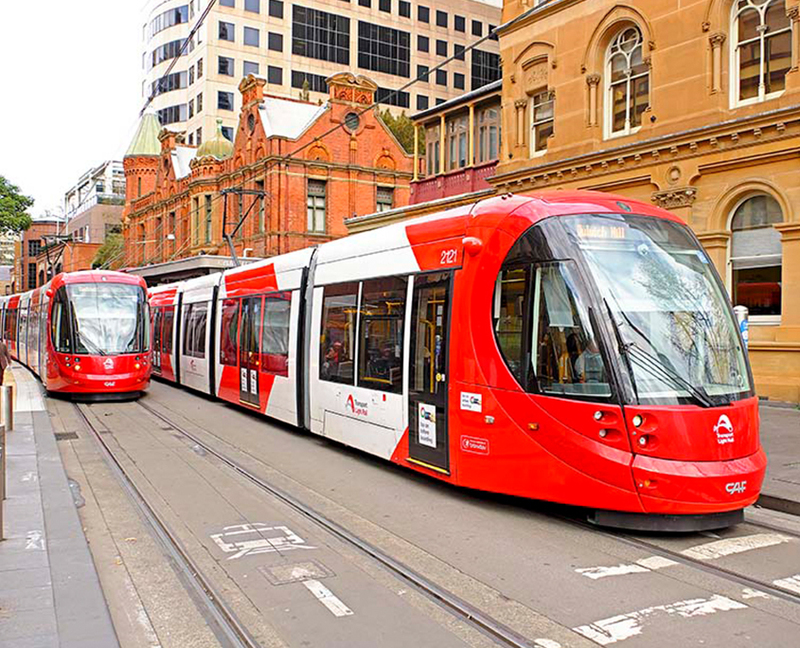 You can find out more about the Sydney Light Rail project here.